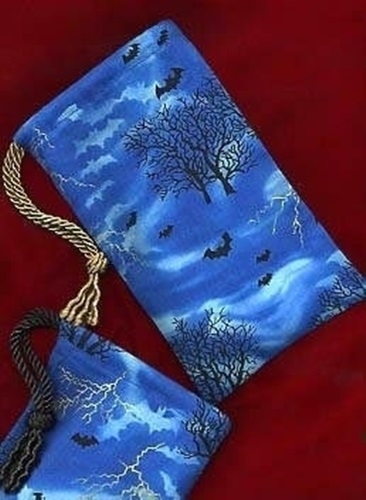 With bats, lightning, a stark trees against a royal blue sky, this fabric is just right for any Tarot deck with a Gothic, mystery, or horror theme. Your Vampire Tarot, Halloween Tarot, or any other Gothic or darkly styled deck would love to reside in this Tarot bag. The lightning in the fabric is a shiny metallic gold. Whether you're a fan of Stoker's Count Dracula, Anne Rice's Lestat, or Meyer's Twilight, any Vampire fans will love this bag for holding their special treasures. 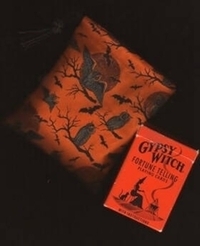 Includes: One regular size tarot bag, which fits a standard size tarot deck. Fits most oracle or tarot card decks that measure approx. 5" x 3" and below. All of our tarot bags are individually handcrafted with care to ensure quality. Please allow for slight, natural variations in size of the bag or pattern placement.